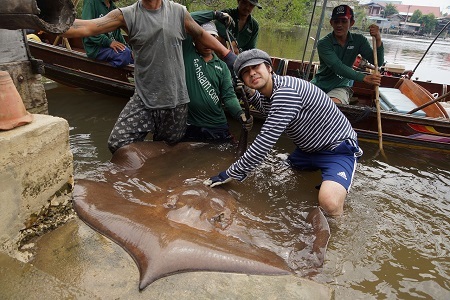 Japanese angler Hiroshi started his Thailand stingray fishing holiday by fishing at the Maeklong River. On arrival at the Maeklong River Hiroshi was soon travelling downstream to the infamous Area 51 section of the Maeklong River. On arrival the fishing boat was carefully positioned on a wide bend ad the anchor dropped in eighteen feet of water. Baits were carefully placed by the guides who rowed out to previously productive areas before lowering them down to the bottom. With the incoming tide starting to make the river levels rise the anglers waited patiently for the Giant freshwater stingrays to become active. It was not long before one of the baits was picked up by an unseen Giant freshwater stingray causing line to be stripped from the Okuma multiplier and heavy duty stingray fishing rod. Hiroshi wound down into the unssen Giant freshwater stingray causing the rod to arch over violently towards the surface of the river. The guides and captain wasted no time and soon pulled up the anchor allowing the stingray to in effect tow the boat several metres upstream. Constsnt pressure soon took its toll on the Giant freshwater stingray and it was not long before the Giant freshwater stingray was languishing in the net alongside the boat. The stingray was estimated to weigh 30kg’s and was quickly released after a few photographs. Returning back to Area 51 saw the anglers soon connected to another Giant freshwater stingray which seemd to be slightly larger than the last one. On this occasion after receiving the take the stingray almost instantly went to ground burrowing deep into the sandy substrate. Repeated attempts by the anglers to shift the Stingray didnt seem to be working so the fishing boat was expertly maneuvered slightly upstream allowing the anglers to pull from a different angle. With the anglers applying pressure from a totally different angle the Giant freshweater stingray was soon moving again and was soon brought away from the bottom where it gracefully kited around under the fishing boat. Several minutes passed as the Giant freshwater stingray was gently coaxed up towards the waiting net before wildly thrashing its tail as it broke through the surface layers. The Giant freshwater stingray was expertly netted and slowly transported to the riverside where it was estimated to weigh possibly 80- 90 kg’s. The stunning Thailand River Monster was quickly photographed before being released back into the Maeklong River unharmed after its capture. With the tide now starting to make its way back to the Gulf of Thailand the days Thailand stingray fishing came to an end.